If you follow new cars, you’ll know that the VZ Commodore is a transitional model. It uses a body design that was fundamentally introduced with the 1997 VT Commodore, suspension which has been tweaked but dates back even further – and a brand new, high tech, quad cam, 3.6-litre engine. So, an on-paper summary would suggest that the body and suspension design might now be getting a bit tired, but that the cutting-edge engine rescues the package. That might be what you’d think – but you’d be wrong, wrong, wrong! 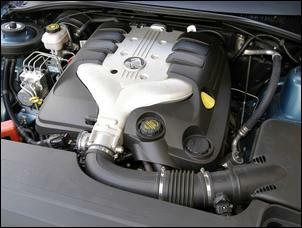 In fact, the new engine is the weak link in the car’s mechanical make-up. On test was the $40,990 Acclaim wagon, complete with the old four-speed auto and 175kW version of the new Alloytec engine. 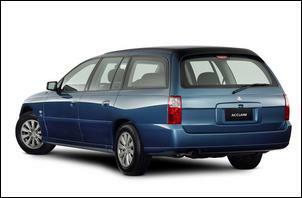 Australians buy family wagons like this to, er, carry families – and often do so over long distances. So, we thought, what better task than to drive the car from the Gold Coast to Sydney and return, complete with a young baby in the back and the amount of gear that only a first-time mother can think to bring along? The road followed the inland route down the New England Highway - about as typical an Australian secondary country road as it’s possible to find. We then joined the freeway at Newcastle, spent two days with the car parked at the hotel in Sydney, and then returned the same way. The total distance was about 2500 kilometres, completed in four days. Interestingly, there was a second car accompanying the Holden on the return trip – a 1969 Austin 1800, which had just been purchased. This limited the return speed to 90-100 km/h. With the trip down completed at the 100/110 km/h open road speed limits, it can be seen that the Commodore was most times just trundling along. Fuel economy? Well, it should have been exceptional – what with all that new alloy gee-whiz wizardry under the bonnet and the slow open road speeds. We averaged 9.2 litres/100 km and can confidently say that we can’t imagine anyone with a VZ Commodore wagon getting better in any real world use. That consumption is at least 10-15 per cent worse than we expected in these conditions, and in fact poorer economy than we have heard the old 3.8 litre pushrod engine getting in similar trips. And the performance? If it was scintillating, that economy would be forgiven - but it simply isn’t. The 0-100 km/h time we gained (car unladen, one person, low fuel) was about 9.3 seconds 0-100 – certainly nothing to write home about. But more important than the bare number is that on the road, the car never feels particularly punchy. The new engine has a very flat torque curve (ie there’s higher than usual power available at all revs), but the absolute torque output isn’t very great. In other words, this is a car that needs to automatically change back a gear when confronting only modest hills. Dial in the (very good) cruise control, get on the open road and the engine feels quite gutless. When it sees a hill, it firstly drops out of overdrive torque converter lock-up, then is often forced to change back to third gear. Of course, lots of modern V6 engines behave in a very similar manner, needing revs on board to pull the tall gearing up hills. But without any exceptions, those engines are far sweeter than the Holden’s. For this is an engine that noisy and harsh, at high revs feeling strained and unhappy. It’s simply light-years less refined and sweet than any Toyota six cylinder engine of the last decade, noticeably inferior to the Ford six, and not even as good as the now quite old Magna V6. Compared with the superb Honda Accord V6 (incidentally, a car in the same price range), the Alloytec feels like it’s from a different, long ago era. In fact, it’s impossible to describe any aspect of the engine (apart from its electronic throttle control, which we’ll come to) as a highlight. Idle quality? – poor, and at times (when heat soaked?) astonishingly poor. Economy? – certainly not outstanding. Performance – nothing to write home about. NVH? – hell no. And the auto trans shows its age, with only four ratios and lacking a ‘tiptronic’ style function to allow the driver to easily operate the ‘box in a semi-manual mode. But the rest of the car? Paradoxically, it’s damn’ good! Holden engineers have been refining their MacPherson strut/semi-trailing rear-arms-plus-a-link suspension for years. In this car they’ve sharpened the steering a little and what feels like further finessed the dampers. And the result is exceptional. The car rides absolutely superbly and its handling is really very, very good. On the road – whether that’s a freeway, dirt, potholed bitumen or coarse chip tar – the VZ feels refined, composed and competent. About the only glitch is that in gusty crosswinds it can be blown around a little. 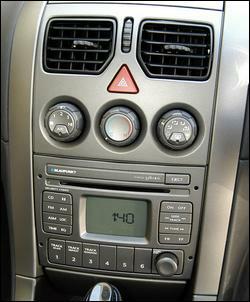 The interior also works very well. The room is enormous, the seats huge and comfortable and the dashboard controls chunky but effective. As you’d expect in a car like this, the air-con is effective (even with the added cabin volume of the wagon) and ventilation is very good. In fact, while we’re sure some of you will laugh in disbelief, the Commodore’s on-road feel, headlights, ventilation and comfort make some double-the-dollars Euros look completely unsuited to this country. The Acclaim is also well equipped with four airbags, ABS, cruise control and an excellent trip computer that also allows various functions - such as road speed-dependent sound system volume control – to be set to suit personal preference. You can even bring up a digital speedo. 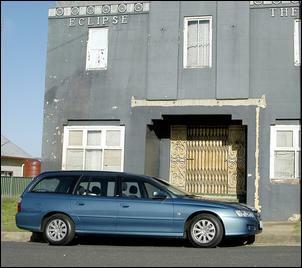 The Holden Acclaim wagon was made available for this test by Holden. Engines that don't need cams, rocker gear or cam belts!